This fruit salad has such a surprising mix of flavors and is so easy to prepare we find ourselves having it quite often. It’s simple to make only taking about fifteen minutes to prepare. If you take the time to make the melon balls it will take a few minutes longer, so shorten your prep time by cutting melons into cubes. In a saucepan, combine water and sugar over medium heat. Bring to a boil, then reduce heat and simmer for 5 minutes, until the sugar has dissolved. Take pan off heat and cool the syrup. Any extra cooled syrup can be saved in an airtight container in the refrigerator. In a blender, combine mint, lemon juice, simple syrup, and amaretto. Blend until smooth. 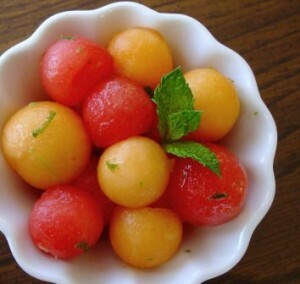 In a large bowl, combine the watermelon and the cantaloupe. Add the vinaigrette and toss. Transfer to a serving bowl and serve.